A common tree of coastal lowland rainforests, often occurring in drier areas. Cut surfaces of the twigs turn black or dark brown on exposure to the air. Leaves are large, up to 30 cm long, simple with entire margins, much paler or even whitish on the undersurface. The sap of this tree is caustic, and can cause severe allergic reactions. Flowers are tiny and insignificant, white or greenish, with 5 petals. Both male and female flowers occur in one inflorescence. 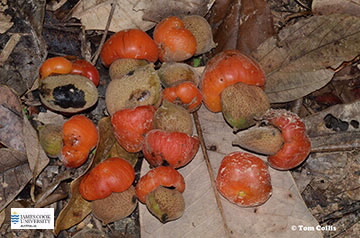 The fruit is actually a nut, seated on a large fleshy orange receptacle about 20-30 long x 30-50 mm wide. The nut is brown and rounded, with a small beak at its tip.